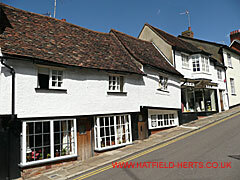 This section contains photographic images of some landmarks in the western part of Hatfield. 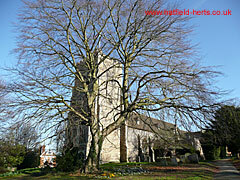 St Etheldreda's Church, Old Hatfield – One of Hatfield's gems. Although most of the building above ground is a few centuries old, there has been a church here for a thousand years. Hatfield House, Old Hatfield – Built by Robert Cecil in the early 17th Century, it is currently home to his descendant the 7th Marquess of Salisbury. 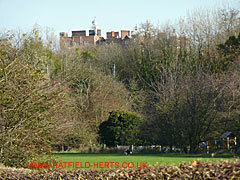 Part of the Old Palace, which was the childhood home of Edward VI and Queen Elizabeth I, still stands in the grounds. 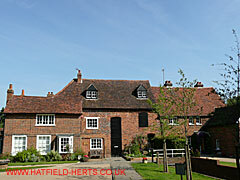 Mill Green Museum and Water Mill, Mill Green – Home of the Welwyn Hatfield Museum. For many years was one of only two working watermills in Britain. A mill is thought to have occupied this site going back to the time of the Domesday Book (11th Century). Old Coach-house, Park Street – now a private residence, this was the equivalent of an early motorway service station. 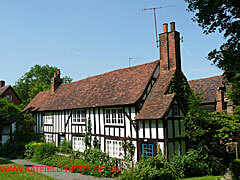 Hatfield was the first main stop on the Great North Road from London. Fore Street, Old Hatfield – once part of the route of the Great North Road, it is now a much-sought after residential area. It once echoed to the footsteps of Charles Dickens, Thomas Hardy and Samuel Pepys. 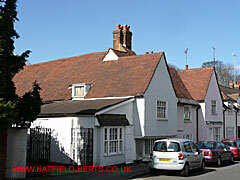 Church Cottage, Old Hatfield – Tudor-style timbered building, it has been used as a school, bakery and pub.